Thousands of British troops are currently being “held at readiness” in case of a disastrous no-deal Brexit. 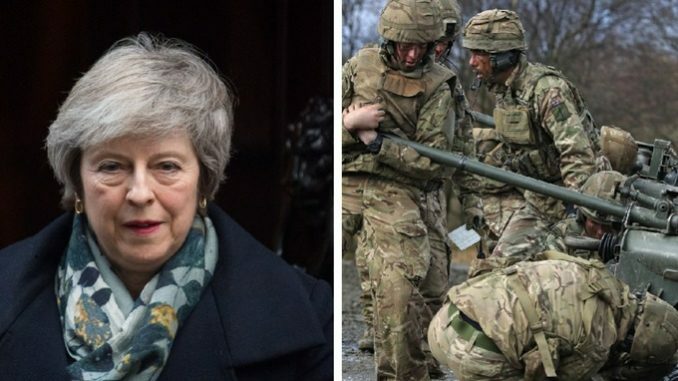 The government has announced that over 3,500 troops have been put on standby to handle any fallout of Britain crashing out of the European Union without having secured a withdrawal deal. The announcement came as No. 10 said it would issue official advice for every family in Britain to prepare for a chaotic no-deal Brexit. Williamson’s statement came on the heels of the Cabinet agreeing to activate all of the 106 No Deal ‘technical notices’ issued by the UK government. The documents note a litany of potential disruptions, including grounded flights, fuel and food shortages and hospitals running low on medicines should Britain crash out of the EU in March. In preparation for no-deal, or as a tactic to garner more concessions from the EU, the government has committed another £2 billion ($2.5mn) to help departments prepare for the potential chaos. Cabinet intends to notify some six million British businesses to start their own no-deal preparations, according to reports in the Sun, including to some 145,000 firms that export to the EU. The preparations come amid continued opposition to Prime Ministers Brexit deal, which if accepted by MPs would stave off a no-deal. The PM, however, has not given MPs a chance – as is their mandate – to vote on the deal, fearing defeat. The government has promised a Commons vote on the deal on the week starting Jan 14, 2019. Next Next post: Mother Teresa – A Saint Or A Sadistic Religious Fanatic?